Paris, April 29th 2013 - Venturi and the Ohio State University introduced their third attempt at FIA homologated Electric Vehicle Land Speed Record scheduled for September 2013. Venturi is a well known French sports and racing car company that ended in financial difficulty. Gildo Pallanca Pastor acquired the company and initiated a reconversion through electric propulsion. 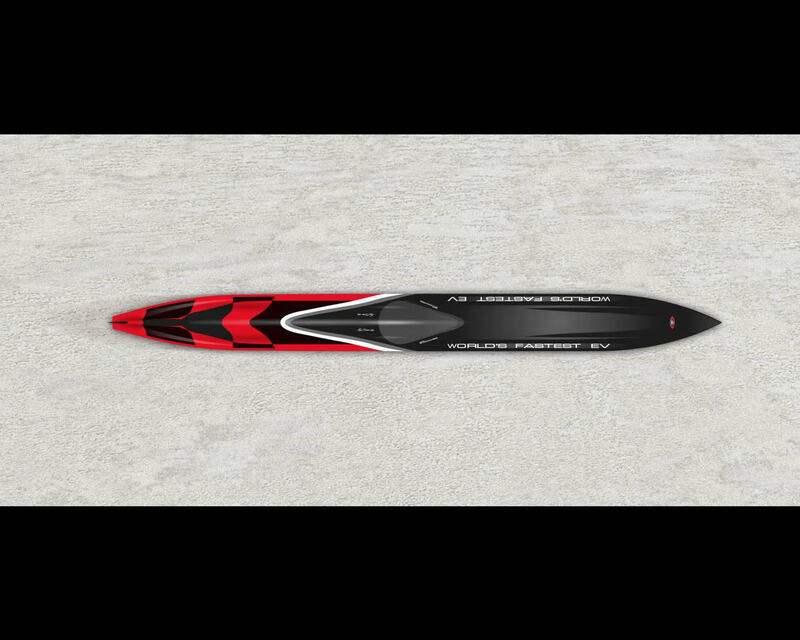 The company has developed its own expertise in the electric propulsion. The first result was the Venturi Fetish electric roadster, a high performance electric car with 350 km operating range and a sales price of about 300.000 Euros. The prototype was introduced in 2004. Ten Fetish have been sold till 2010 when Venturi introduced the Venturi America the production of which is scheduled to start in early 2014. Only a 100 America will eventually be produced. Venturi was also involved in the preparation of a 1000 Citroën Berlingo and Peugeot Partner adapted to electric propulsion. The French mail distribution company La Poste is presently operating 200 of such vehicles in everyday use. The Company also initiated several Challenges to develop and promote electric transportation solutions. Electric Car Land speed record is one of those challenges. The preparation is made in partnership with Giorgio Rizzoni, professor at the Ohio State University for research and development on automobile. Giorgio Rizzoni and his team have been involved in several project for land speed record automobile. 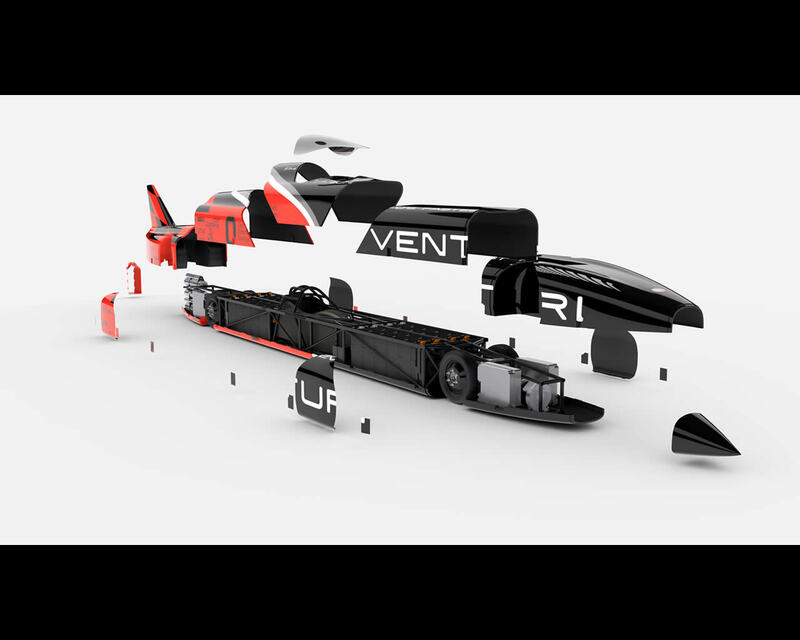 With nearly 3,000 hp (2 X 1,500 hp), the 3rd generation of Venturi VBB will be the most powerful and fastest electric vehicle ever built. 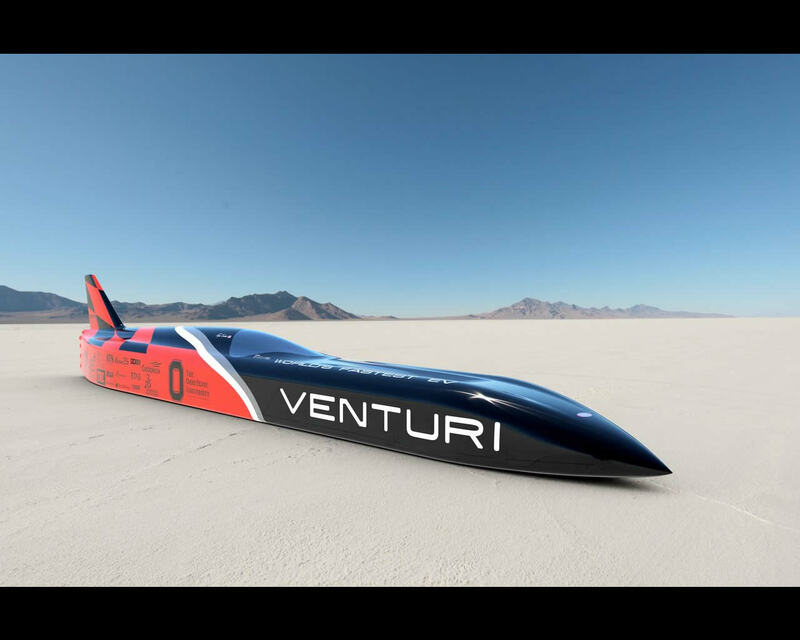 Roger Schroer, test driver at the Transportation Research Center (Ohio) and current holder of the FIA land speed record set in 2010 on the Venturi VBB-2.5 with 307 mph (495 km/h) will target the 400 mph in 2013, 440 mph in 2014 and over in 2015. Since 2009, the Venturi Buckeye Bullet Racing “Jamais Contente” holds the world land speed record for an electric vehicle. In 2009, 487 kph was reached with a fuel cell propelled electric vehicle. In 2010, 495 kph was reached with full battery operated electric vehicle. The nickname “Jamais Contente” recalls the first electric car speed record by Jenatzy in 1899 with his bullet shaped electric prototype. According to Gildo Pallanca Pastor, CEO, Venturi Automobiles, "... by designing the most powerful electric vehicle in the world, we are consolidating our lead in the field of electric propulsion, but perhaps more importantly, we are innovating in order to optimize energy efficiency, one of the greatest challenges facing not only the automobile industry, but society in general." Venturi Buckeye Bullet VBB 2 in 2009 was a streamlined road going missile with two wheel drive, a total power of 550 kW and a Balard 2000 cells Hydrogen fuel cell making 2,63 tons including 1,4 tons for the fuel cell/battery system. The VBB2 had a tubular space frame with a central pilot safety structure made of a Prepeg carbon fibre / aluminium honeycomb composite tub. The skin of the 11 meter long, 1 meter wide vehicle was all carbon fibre composite. 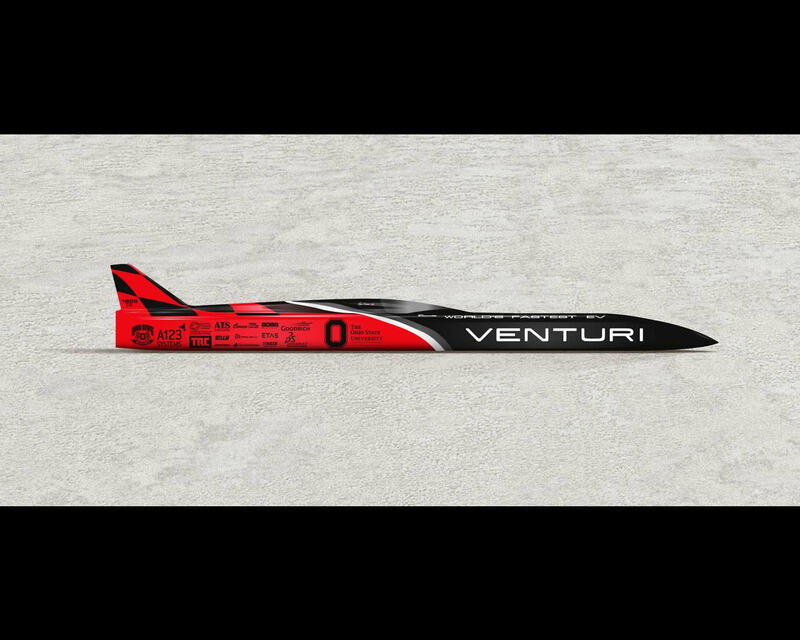 Venturi Buckeye Bullet 2.5 in 2010 was similar in construction and size to VBB2 but utilised only Lithium Iron Phosphate batteries made of 1500 cylindrical elements and weighing 400 kg. The total power was 600 kW. Total weight of the vehicle is 1.95 tons.The projected Buckeye Bullet VBB3 “Jamais Contente” is under construction in Ohio. It will have four wheel-drives and two specially designed and manufactured electric motors for a total power of up to 2200 kW. There is one electric motor for each two wheels rather than four motor because of narrow width. The challenge is that power is required for performance but power stored in batteries results in weight. The best compromise is evaluated in computer simulations. 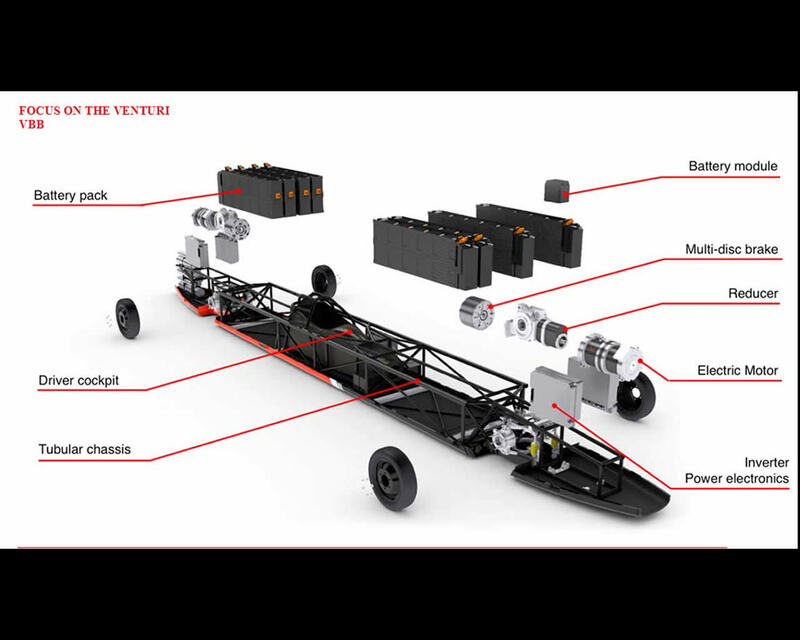 The Lithium Iron Phosphate battery packs, one in front and one at the rear will add up to a total of 1.6 tons for a total vehicle weight of 3.2 tons. The pilot, Roger Schoer, will be operating in a central driving cell similar to Formula One racing car and a reinforced roll bar cage. The seating position is nearly horizontal to reduce drag while allowing sufficient visibility. The FIA rules prohibit camera or periscope vision. The electronic control adjusts operation between front and rear axle motors. Most land speed record for this type of vehicle are performed at Bonneville Salt Lake in Utah,USA. Speed build up test are performed at Transportation Research Center in Ohio. The FIA land speed rules measure speed over one mile or one kilometre at full speed. The vehicle thus needs a long distance for speed build up and a similar one for coming back to rest. The speed measurement is performed in two opposite direction within one hour maximum time. The stopping of the vehicle is by a set of parachutes and multi-disc brakes. For an electric vehicle, there is a need to replenish the batteries after the first stop and complete it within an extra limited time to comply with the total one hour specified for the homologation of the performance. The most critical aspect in the design is straight line stability at extreme speed. The tyres are built in Ohio by specialist Mickey Thomson Company, a division of Cooper Tyres. A first official attempt is scheduled for the Speed Week in August 2013 at Bonneville (US LAND SPEED RECORD, CERTIFIED BY THE SCTA-BNI). Photo Legend - Photo 1/12 shows from left to right Gildo Pallanca Pastor, President Venturi Automobiles, Giorgio Rizzoni, Professor and Automobile Reasearch Laboratory Director at the Ohio State University, the lady in charge of land speed program, Nicolas Mauduit, Program Director Venturi Automobiles and Roger Schroer, pilot at the Transportation Research Center Ohio and VBB3 pilot.